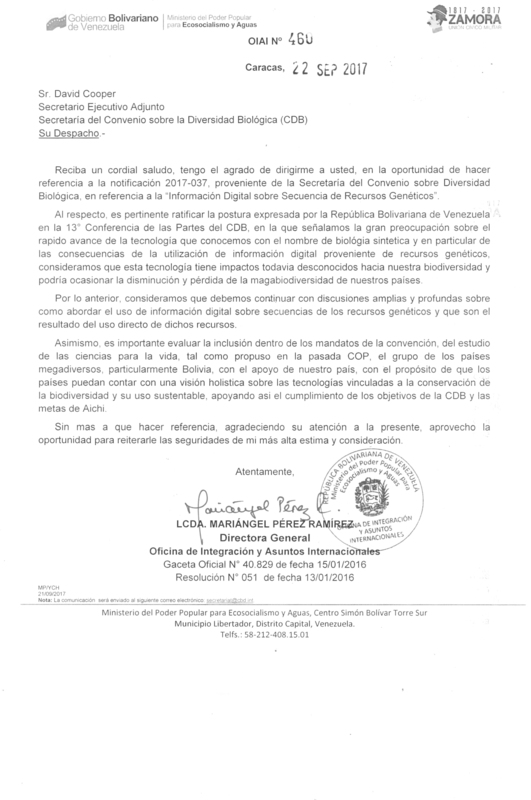 An Ad Hoc Technical Expert Group (AHTEG) on Digital Sequence Information on Genetic Resources was established by decision XIII/16 of the Conference of the Parties of the Convention on Biological Diversity. In accordance with decision NP-2/14, the AHTEG will also serve the Nagoya Protocol. A meeting of the AHTEG on Digital Sequence Information on Genetic Resources was convened thanks to the financial support of the Government of Canada and the European Union from 13 to 16 February 2018 in Montreal, Canada. Among other tasks, the AHTEG considered the compilation and synthesis of views and information submitted by Parties, other Governments, relevant organizations and stakeholders, as well as a fact-finding and scoping study commissioned by the Executive Secretary. The report will be considered by SBSTTA-22. The Executive Secretary was requested to commission a fact-finding and scoping study to clarify terminology and concepts and to assess the extent and the terms and conditions of the use of digital sequence information on genetic resources in the context of the Convention and the Nagoya Protocol. The study was carried out thanks to financial support from the European Union and the Governments of Canada and Switzerland. It was made available for peer-review (notification 2017-115) between 9 November and 1 December 2017. The comments received in response to this notification are presented below in the form and language in which they were received. In decision XIII/16, the Conference of the Parties to the Convention on Biological Diversity invited Parties, other Governments, indigenous peoples and local communities, and relevant organizations and stakeholders to submit views and relevant information to the Executive Secretary on any potential implications of the use of digital sequence information on genetic resources for the three objectives of the Convention. The Conference of the Parties serving as the meeting of the Parties to the Nagoya Protocol invited these submissions to include information relevant to the Nagoya Protocol (decision NP-2/14). The Secretariat invited the submission of views and information through notification 2017-37. The submissions received by the Secretariat in response are available below.